Music in the Round Rocks! Grapes and Hops downtown has been serving up more than a stellar offering of wine and beer lately. Rufus Philpot has put together top-notch musicians calling themselves No Mad Trio featuring his mad bass beats and Steve Hass (Manhattan Transfer) on drums and Matt Rohde (Associate Music Director from American Idol) on keyboards; they’ve been playing just about monthly on early Sunday evenings. But one cooler than cooler night of music was a singer songwriter music in the round which featured our very own Shawn Jones (along with Sam Bolle) playing host to Suzie Candell (whom he’s been producing), and Jeff Silbar who won the Grammy for song of the Year when he wrote “Wind Beneath my Wings” (Bette Midler had the huge hit with it and it was featured in the movies “Beaches”). I asked Silbar if he ever gets tired of playing “Wind”, but he said he never does because he never plays it the same way twice. 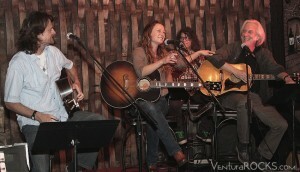 It was a great night watching the camaraderie and talent and hearing great stories behind the songs. Country star, Lacy J. Dalton, played a fundraiser for the Santa Paula Animal Rescue Center at Discovery on Friday, February 13; upcoming Reggae shows to watch for include a night with Hirie and Arise Roots on Thursday, February 19, and then on February 26 it’s Tribal Theory with Dirty Rice opening. Bombay’s will be hosting a Johnny Cash Birthday bash on Sunday, February 22 from 1-6 pm featuring live music from Hard Six, Big Tweed and the Mighty Cash Cats. Proceeds benefit the Ventura County Animal Services. Golden China will feature live music on Thursday, February 19, when the Vic Moraga Band will get the swing dance crowd swinging, then on Saturday, February 21, Coven will bring their own brand of Goth Rock to the big room. Hi Hat Entertainment continues to bring on the best of the blues to the Ventura Beach Club; shows to watch for include Lightnin’ Willie on February 20, The Forty Fours on February 27, and always a crowd favorite Billy Vera and the Beaters on March 13. The good folks at Green Art People have been bringing live shows weekly in a family environment for over six years every Wednesday and now they are offering their weekly shows in the privacy of your own home for as low as $1 a show which you’ll receive Monday mornings. You can contribute more per show and cancel at any time. It’s a great way to support this non-profit who will be splitting the donations with the bands. Upcoming shows include GrooveSession on the February 18 and Rooster Ra with Kyle Swan opening on the 25. Loving social media? You can follow us on Twitter at VenturaRocks1; Instagram at VenturaRocksWebsite and on the granddaddy of them all Facebook at Ventura Rocks-Website. If you have any music related news or upcoming shows you want help publicizing? Send all information short or long to Pam@VenturaRocks.com.